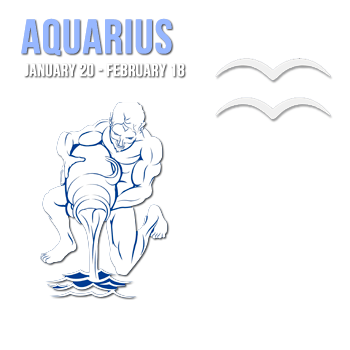 Aquarius, strong and attractive, falls into two principle types: one shy, sensitive, gentle and patient; the other exuberant, lively and the exhibitionist, sometimes hiding the considerable depths of their character under a cloak of frivolity. Both types are strong willed and forceful in their different ways and have strong convictions. Since they seek truth above all things, they are usually honest enough to change their opinions, however firmly held, if evidence comes to light which convinces them that they have been mistaken. They can see both sides of an argument without dithering as to which side to take. Unprejudiced and tolerant of other points of view they can see the validity of the argument, even if they do not accept it themselves. They obey the Quaker exhortation to "Be open to truth, from whatever source it comes," and are prepared to learn from everyone. Both types of Aquarius are humane, frank, serious minded, genial, refined, sometimes ethereal, and idealistic. This last quality is tempered with a sensible practicality. They are quick, active and persevering without being self-assertive. They can express themselves with reason, moderation and sometimes, dry humor. Nearly always intelligent, concise, clear and logical, many are strongly imaginative and psychically intuitive, so that the Age of Aquarius is much anticipated by psychic circles as an age in which mankind will experience a great spiritual awakening. Aquarius can end up speculating on the philosophical so they become entrapped in an ivory-tower existence where they meditate on abstractions that bear little resemblance to reality. It can help those who have scientific inclination to combine these with the Aquarian yearning for the universal recognition of the brotherhood of man. It allows them to delve into scientific research and fulfill their philanthropic ideals of benefiting mankind. When inspired, they are capable of such devotion to it that they may drive themselves to the point of exhaustion even risking injury to their health. Both Aquarius types need to disengage from time to time and spend a while alone because their intensity can create problems for them. They benefit greatly from meditation or, if religious, from retreats. Even in a crowd they are fiercely independent, refusing to follow like sheep. They shun interference from others, no matter how helpful the intent, and accept it only on their own terms. In spite of the often intensely magnetic, forthcoming and open personality of the more extroverted kind of Aquarian, and of their desire to help humanity, neither type makes friends easily. They sometimes appear to condescend to others and take too little trouble to cultivate the acquaintance of people who do not particularly appeal to them. Because they don�t give of themselves easily, they are sometimes considered cold. However, once they decide someone is worthy of their friendship or love, they can seem to become intensely hypnotic. They can become tenacious friends or lovers, ready to sacrifice everything for their partners and be faithful to them for life. Sometimes they can become disappointed emotionally because of their own high personal ideals. Beware of deceiving this sign because their anger can become terrible/ If disillusioned, they do not forgive. Aquarians work best in group projects, provided that they are recognized as having a leading part. They have a feeling of unity with nature and a desire for knowledge and truth that makes them admirable scientists, especially astronomers and natural historians. They may excel in photography, radiography, electronics as well as anything connected with the electrical and radio industries. They can be avidly involved in aviation and everything technical. On the arts and humanities side their progressive tendencies can be expressed in writing, especially poetry, and broadcasting, or as welfare workers and teachers. Some have a gift as entertainers and make good character actors (having an ability to mimic) and musicians. The more psychic among them possess healing gifts, especially in curing the mentally ill. There are a few of this sign who exhibit some unpleasant faults. They are liable to be fanatically eccentric, wayward egotists who can be excessively detached and inclined to retreat from life and society. They can show a tendency to be extremely dogmatic in their opinions. It is said that Aquarians can be a threat to all they survey or a great boon for humanity in general.